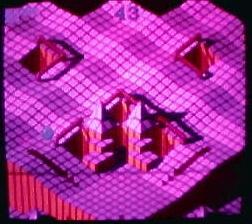 Marble Madness debuted in 1984 and was the first system 1 game that Atari released. It was the only simultaneous 2 player system 1 game made. Its objective is very original and simple: use a trackball to manuever your marble through the course and make it to the finish before time expires. This task is not as easy as it sounds. There are numerous enemies as well as your opponent to slow you down. This is the best system 1 game made in my opinion. The graphics and the stereo sountrack are excellent and definately were ahead of their time. I just wish it had more than 6 levels! Oh well, I can hope one day that someone will dig up those Marble Madness 2 ROMs.